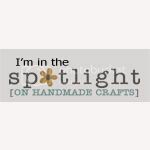 Making jewelry is fun and it is so absorbing that sometimes we, jewelry makers can bring quite some pain, injuries and other health hazards in our lives. Yes, these are the agony and ecstasy of this profession. Repetitive Stress Injuries is a common thing in jewelry making. Rena Klingenburg in her article has elaborated what it is all about and how we can avoid much of them. Correct posture, ergonomic awareness, choosing the right jewelry making tools are important aspects that we often tend to over look. I found another beautiful blog where Patricia writes about the wrist tendonitis and carpal tunnel syndromes and explains them nicely. Some preventive suggestions are also provided. Look, what hand stamping craziness can go on in these forum discussions if you are not careful, and many times we, moms do have to do multitasking and we tend to forget about our own health and safety. Two years ago I had a serious case of sciatic pain that I have shared in my blog and I think getting too absorbed in my beading, sitting for long stretch of time without a break, was a crucial factor for that condition. Now I use a kitchen timer. Seriously. And never allow myself to sit for more than thirty minutes at a time. This also measures how much time I am putting in individual jewelry making and makes it easier for pricing it later. 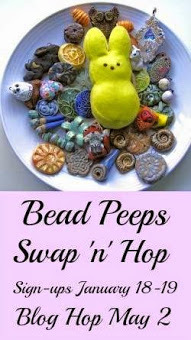 Since I work from home I have divided my house work and gardening chores with beading to give my body some movement and high energy work outs and then some calm beading time. This solves my problem to some extent. Today I am going to share something very unique that I have not seen or heard of. 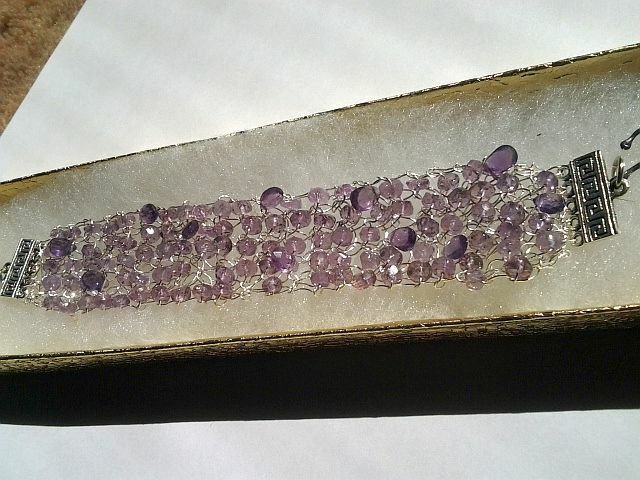 I was going to make a fine knitted jewelry bracelet with silver wire and amethyst gemstone for a bride as her wedding gift. After fifteen minutes or so my fingers were really stressed, much more than usual. Especially my forefinger of the left hand, where the skin meets the nail started turning red and then purple. It was bleeding inside. The bride loves purple, and I had only that afternoon to finish. 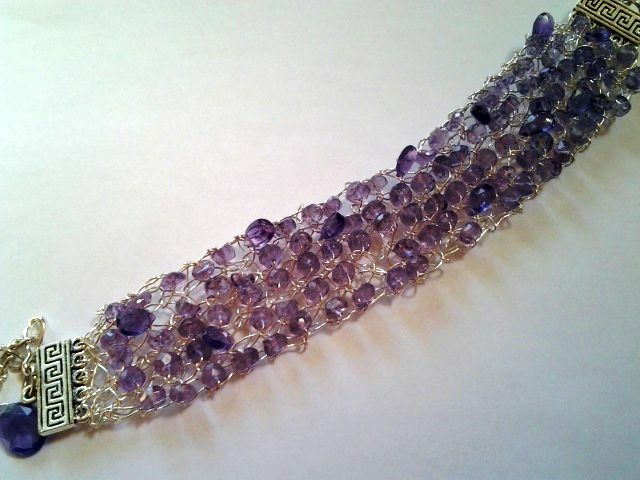 So I kept going on and finally finished the bracelet. 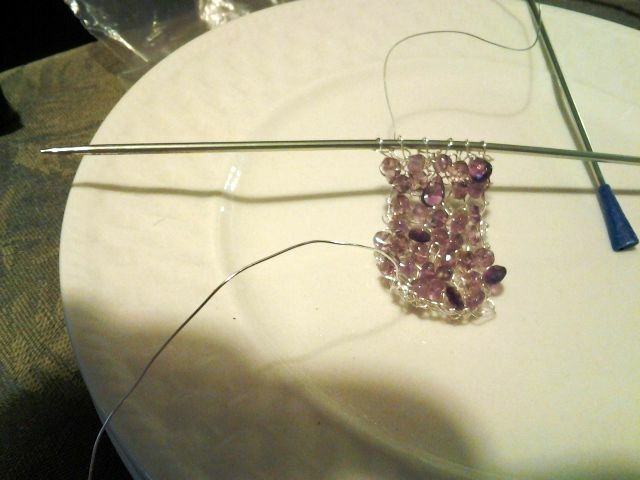 Wire knit bracelet with 26 g wire and US size 1 needles. The mistake I made was- I used 26 g wire and size US 1 needles. I should have used thinner wire and thicker needles. 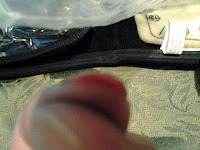 See here in the picture below I have used a 28 g wire and a much thicker pair of needles, a size US 4 needles to be precise. It was much easier to knit and can you tell the difference? But that wrong decision of using 26 g wire with size 1 (very thin) needle made my fingers purple and kind of paralyzed me from jewelry making for a couple of days. When giving hurts that is a gift! Good advice, Dita - all crafters need to be aware of this. Thank you Deena for dropping by and leaving your comment. They are very precious to me. Dita.